Clear winners: rich Chinese who buy homes in Canada. The Canadian dollar swooned 1% against the US dollar on Friday, to US$0.7270, after having gotten hammered for the past six of seven trading days. It’s down 5% in December so far, 15.5% year-to-date, and 31% from its post-Financial Crisis peak of $1.06 in April 2011. It hit the lowest level since June 2004. It got clobbered by the commodities rout, given their importance to the Canadian economy, the multi-year decline in the prices of metals, minerals, and natural gas, and then starting in mid-2014, the devastating plunge of the price of oil. That the Fed has tapered QE out of existence last year and has been waffling and flip-flopping about rate hikes ever since made the until then beaten-down US dollar, at the time the most despised currency in the universe, less despicable – at the expense of the loonie. Those factors would have been enough to knock down the loonie. But it wasn’t enough, not for the ambitious Bank of Canada Governor Stephen Poloz. The man’s got a plan. He is in an all-out currency war. He’s out to crush the loonie beyond what other forces are already accomplishing. He’s out to pulverize it, and no one knows how far he’ll go, or where he’ll stop, or if he’ll ever stop. He has single-handedly created the short of a lifetime. It should spook every Canadian with income and assets denominated in Canadian dollars and Canadians wanting to buy a home in their country (we’ll get to that bitter irony in a moment). One reason for pulverizing the Canadian dollar is to boost revenues and earnings of exporters. They get to translate their foreign-currency revenues into Canadian dollars on their financial statements. And analysts love that. It doesn’t matter how the bigger numbers got there, whether by inflation or devaluation, as long as they’re bigger. And Canadian stocks could use some help. Despite the destruction of the loonie, the Toronto Stock Exchange index TSX has plunged 18% since its peak in June 2014 and is now back where it had been in September 2013. So Poloz is trying to get Canadian workers to be able to compete with workers in Mexico and China and Bangladesh, and with those beaten-down wages in the US. Alas, the Mexican peso too has gotten crushed. But ironically, the Bank of Mexico is spinning in circles to halt the decline. It’s selling its limited dollar reserves and buying pesos to prop up its currency, even as Canadians watch helplessly as their own currency descends into banana-republic status – something the US dollar used to excel at when the Fed was on its path of total dollar destruction. Poloz has cut the Canadian benchmark rate twice this year, including a surprise cut in January that whacked the loonie. When he saw that the loonie hadn’t plunged far enough, he defended his rate cuts by predicting that Q1 numbers would be “atrocious,” which whacked the loonie. When it was revealed that GDP shrank 0.6% annualized in Q1, it whacked the loonie. In April, he defended the use of the word “atrocious,” explaining, “It’s certainly not our intent to surprise or to frighten people.” He’d simply “wanted markets to understand that we already believed that the quarter was going to look quite poor….” It whacked the loonie. In July, he explained that the “global economic developments have been quite disappointing,” that they led “to a significant downgrade” for Canada’s economy, and that the collapse in oil prices was eating into the economy at the worst possible moment, when it was undergoing a “significant and complex adjustment.” It whacked the loonie. He keeps up the good work. He’s just never satisfied with it – always tries to perfect it, like a meticulous artist. On December 8, Poloz warned out of the blue, with no one having even considered it, that the Bank of Canada was considering negative interest rates. During the Financial Crisis, the Bank of Canada had maintained that a positive 0.25% would be the lowest possible rate; otherwise, certain corners of the financial markets, such as money markets, might collapse. But not anymore. “The bank is now confident that Canadian financial markets could also function in a negative interest rate environment,” he said. He stressed that the bank had no intention at the moment to do so. But “it’s prudent to be prepared for every eventuality.” The loonie had already gotten whacked the day before in anticipation. And upon his words, it got whacked again. The next day, the loonie got whacked 1%. These are just examples. Poloz does this all the time. 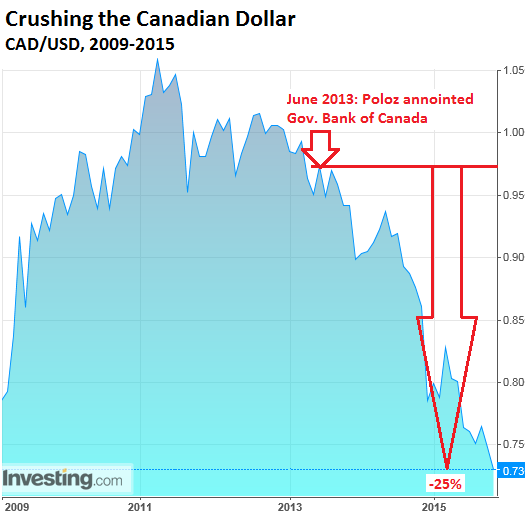 Unlike the Bank of Japan and the ECB, which also face economic challenges, the Bank of Canada is able to destroy its currency without having to resort to mega-QE. It destroys it verbally. The oil price collapse helps, but it’s still true art. But pulverizing the loonie so consistently, predictably, and forcefully – while it makes for the mother of all shorts – has some side effects, and perhaps that’s part of the plan too. It makes it cheaper for Chinese investors, whose currency has risen in near-lockstep with the “strong dollar,” to buy Canadian assets, such as government bonds – and real estate in one of the most glaring housing bubbles on earth. Home prices jumped 9.3% in Toronto and 9.8% in Vancouver year-over-year in November, according to the Teranet-National Bank House Price Index, but only for Canadian buyers who earn their keep in Canadian dollars. For Chinese buyers who obtain their wealth, by hook or crook, in yuan, prices dropped as the loonie plunged 12.5% against the yuan over the 12-month period. Poloz’ efforts make it cheaper for Chinese buyers to buy a Canadian home, while they make it more expensive for Canadian buyers. And by flooding into the smallish Canadian market and buying on the cheap with their yuan-based wealth, Chinese buyers are driving up costs even further for Canadian buyers. And when Canadians finally can’t buy anymore, when the housing bubble begins to hiss hot air, maybe that’s when Poloz will get serious about negative interest rates, driving down the loonie even further and making Canadian real estate even cheaper for Chinese buyers, who then flood in and push up prices, thus moving these homes even further out of reach for most Canadians, all in order to boost earnings per share of some exporters. 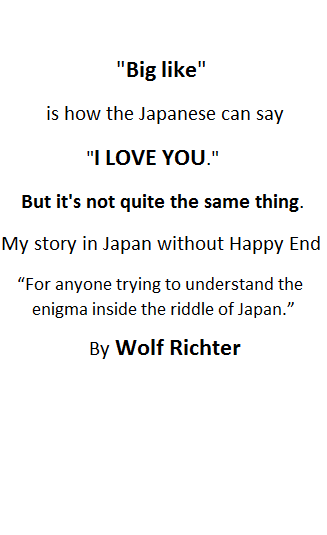 Great article again, Wolf. It’s sickening how these assholes don’t take into account their own citizens and, instead, play into the hands of the global kleptocracy that enriches the top. 01 percent. Thx for keeping your eye on the ball. I think you may be getting this one wrong, Wolf … I reckon CAD will bottom out a 70 cents, and it´ll then trade in a 70-78 cent range. – the theatrics and talking down of the currency will be, and probably are, of little long-term effect. CAD maybe would have come down as much as it has on its own, but the jawboning by Poloz might be a way to give the market the impression that he´s got the whole process under control. And that is not the impression one gets from the FED, if I may say so…. I’m actually not advocating shorting the CAD now. I’m saying that the BOC created a short … starting years ago, not today. Agree on the bottoming of commodities. Watch support for copper at $2 and cotton at $.60-$.62. Oil is the real story, and we are grasping for when the true shakeout in shale related production will decrease Non-OPEC supply and whether world oil demand will increase next year. If excess supply drives down oil prices into the low 30’s, then the Canadian economy will suffer through a tough winter. No mention of fiscal policy? Lots of variables, but the property boom in Vancouver and Toronto could be on its last legs, and then you have to worry about Canadian banks. A true contrarian will be buying Canadian stocks when the “loonie” finds a base of support! $.63-.$67per Canadian $? And there needs to be a meaningful redistribution of income and assets from that ¨kleptocracy¨ to the broader economy, not because we´re mean spirited, or socialists or because we believe that they are undeserving of their wealth. Foreign investment makes existing property owners more wealthy, not a bad thing. It increases the tax base, creates jobs in construction, and elsewhere. One of Canada’s economic strengths are its livable modern amenity filled cities. Great education and health care. Not everyone will be able to own land in the most coveted places, but they never have. Growth and development allow new areas to mature, become valuable and vibrant as well. Wolf, as per your article, it seems that our currency is being mutilated and contaminated by the Bank of Canada. Fortunately the Bank of Canada has a department to deal with these types of issues. The next phase could be official government action to crack down on foreign buyers, perhaps a new tax? Would be easy money. $500,000 CAD for a shoebox in Vancouver is insanity, can’t go on forever. Do property taxes paid by foreign owners contribute to the social services in Canada? If they do the high prices subsidize these services. If they don’t where does the money go? Petunia: Property taxes in Canada are paid to the municipal government where the property is located. Municipal taxes rarely pay even for infrastructure development, which is why most cities in Canada always beg for more handouts through provincial and federal taxes as well. Some third world countries have far more sensible policies about foreign ownership than Canada does. Last time I looked that shoebox on East Hastings riddled with dry rot and mildew and covered with cement siding fetched well over $1,000,000CAD. I can attest to the flood of Chinese buyers in the Canadian real estate market. I live in an area of kettle lakes north of the Greater Toronto Area. Besides our town council buying into the idea that more and more suburban homes on top of fertile agricultural land is a great idea (and our population skyrocketing over the past two decades as a result and requiring greater and greater investment in infrastructure through higher and higher municipal taxes), I have seen monstrous mansions being built around our lakes where once stood small cottage homes. While only a casual observation, it seems that the vast majority of these McMansions are being occupied by Chinese families–and they may be the only ones that can afford them as prices have continued to climb inexorably towards ridiculous prices. Our $200,000 home (20 years ago) could likely fetch close to $1 million in this mother of all housing bubbles. Pure insanity. I said 1 year ago that the Loonie would get crushed and return back down to the value of the Mexican Peso like it was in the past trading at .65 Cents US and it will. And with our new Liberal Gov’t you can also expect our own QE when boy wonder figures out that the bank is broke with no commodities. Liberals gotta pay for there entitlements that they are entitled to you know. Like JT having 2 Nannies at 90,000 a year pay on the tax payers dime. Left/Right wings of the same diseased bird. Swallow your coffee before heading in! why did we let the private banks lend us money after 1976, and why don’t we go back to the BANK of CANADA creating money for our country,, i do’t understand why we only let private banker to issue money for Canada??? gmc You have hit the heart of our financial problems. To add to your comment: In Canada we have the Comer (vs) Bank of Canada (BOC court case. Constitutional Lawyer Mr. Rocco Galati is handling that case with some success. From 1939 to 1973 the BOC issued monies for infrastructure projects, hospitals and schools at interest free loans. The BOC is owned by the people of Canada through the Bank of Canada act and the Constitution. If our elected officials would exercise Democracy – governance by the people for the people – we could go back to this method of funding and it would answer a lot of our financial concerns. Of course Wall Street, our six major banks and our other foreign lenders would not like this idea. Funny, but it’s difficult to find even a reference to it (let alone any actual facts) online… like it’s been wiped clean (most likely it was just never allowed to be reported on). So, one can only read the tea leaves, and they tell me the “powers that be,” who removed the world from the gold standard and began the corporate dismantling of any and all middle class focused policies around the same time, were busy strong arming the few remaining countries still borrowing interest free. In other words, Mr Global did not take kindly to losing his “rightful” slice of Canadian debt and threatened Canada with financial ruin if it didn’t fall in line (wouldn’t want any of the other vassal nations to get the wrong idea would we). Sorry to be so long winded but to follow up on your question… why in the hell do banks get to lend money at interest that that make up from whole cloth (yes, when you get that $M mortgage the bank simply makes a computer entry in your account… that’s why all the interest (profit) is all up front). And… why aren’t the plebs marching in the street to stop it? Property taxes pay for the education budgets, budgets that are leveled…that is to say the curriculum and supports are the same across all school districts in the Province of BC, and is done so by law. Property taxes also help pay for city/municipal requirements, (some transit costs, infrastructure, wages, etc.). There is also a controversial 1% property transfer tax here in BC, (my home). There is talk, also, about foreign buyers or absentee buyers/owners paying a higher property tax rate. It will probably happen one of these days. regarding statement in article: “It should spook every Canadian with income and assets denominated in Canadian dollars”. Why? Our loggers and mills are still working. Our fish is still sold out of country to high-end restaurants. It is keeping people employed. Sure, vegetables and fruit are more expensive, if imported, but there is no reason to buy imported food as we are more than self-sufficient in basic foodstuffs and energy. There is also a thriving greenhouse industry that grows peppers, etc for the US market. Many have their homes paid for, so rising home prices are not a problem for everyone. Furthermore, there are many many other places to live other than the markets Chinese buyers gravitate towards. While secondary cities like Victoria and Nanaimo are also attracting foreign buyers, elsewhere in the Province they are pretty well absent. My point is that the Country is more than Vancouver, and Toronto housing markets. Perhaps new buyers should hold off even thinking about purchasing a home at the obvious top of an overheated market? Plus, just yesterday it was announced that houses over $500,000 now require a 10% down payment in order to be Federally insured, which basically means ‘if you want to get a mortgage’. 10% is a good thing, it keeps earnest money in the decision process. I live in a rural area, but 6 km away from our house is a village of 300 people. It has a beautiful school, a park, a rec centre with a pool, and a paid city worker of 1…(who looks after the sewer system, water system, etc.) It is possible to buy a 3 bedroom and basement home with a view of Johnstone Straits (crusie ships and storms) and a 5500 ft snowy mountain, for under $200,000. Without the view the prices range from $150-170,000. The same home in Vancouver would be what, two million? I am 60 this year and my wife and I are doing just fine, as are our children. Both kids have their own homes and are working. All their friends are working and are paying off homes. If the rates go negative there will be much protest and anger. I don’t see this happening. The 73 cent dollar keeps people home on staycations. It attracts tourists is droves which helps keep up employment, and also attracts foreign shoppers. It isn’t so much our currency that is in the toilet, rather, the US dollar is over-valued due to a fearsome world looking for a safe haven. It is the cleanest pair of dirty underwear in this over indebted world, in many cases. People are afraid and world currencies have been manipulated by the US ZIRP policies. Our low dollar is a result of this. BC has a balanced budget with a healthy surplus, and by law it is a requirement that school districts and municipalities must make up defecits with surplus/discretionary funds. Long-term financed projects are required to have a funding formula in their bond process. (Tax projections). I wouldn’t want to be a busness owner in Bellingham WA that runs on Canadian shoppers, though. For cross-border merchants it definitely will not be a merry Christmas. Today, there is a huge dump of snow on BC ski hills. I expect that sector will also have a banner year at the expense of US venues. All hills are open and have great snow conditions. We’re doing just fine. Plus, we don’t have whack jobs vying to run our Govt., thank you very much. Trudeau is not my choice, but compared to my American sister’s reaction (who is literally embarassed over the 2016 race for the White House), even the canadian political scene is pleasant. It is a good time to be Canadian, at least the 25,000 arriving Syrian refugees think so!! As do I, and mine. I am glad to hear your world is doing great. However Wolf is pointing out the problem with a low currency. Inflation for one, for example. My brothers farm has few options when I comes to inputs as most are tied to the US dollar. This causes huge inflation to his input costs. This comes at a time when the price of wheat and canola are tanking due to oversupply. Not sure if you have noticed a the grocery store but the prices there are rising very quickly. It is inflation due to a low dollar, and us loosing the high paying oil/natural gas jobs causes a huge ripple effect at the local businesses. Who is going to pay the transfer payments to Ontario, Quebec and all the have not provinces if Alberta and Saskatchewan can not do it? Here on the other coast, Calais Maine has the same problem as Bellingham, no more Canadian shoppers. Yet we are not suffering, my gold is worth 1482$ per ounce. Poloz is doing just fine, and the lobster fishers are making more this year than in many. Prices are well up due to the weak dollar but so is the local bottom line. It is not just American buyers this year. Chinese money is in competition with the usual buyers and they are now operating lobster pounds and doing their own shipping. This low dollar will bring us many more tourists this coming year. So where, exactly, is the downside? It’s your money, Ross, that’s being devalued. But if you don’t own anything denominated in C$, and if you don’t earn income in C$, and if you never leave the country or buy imports or spend any money, well, then there’s less of a downside. Your gold has been devalued 40% in last couple years, 20/20 or maybe you don’t have eye coverage due to your fine living standard. Every asset known to man kind is being devalued all over the globe in last few years and this is just getting worse. Car industry is next followed by real estate and then WHAT? In financial world nothing is crushed unless it is inflated to point of breaking, it was and it will always be. It doesn’t take PhD or Einstein brain to figure this out. Universe is not mess, the mess is only on earth and it is getting sorted out in next couple of years. The only ones to gain from a low canadian dollar will be the rich chinese home buyers. What a dum comment! You need to study a bit more. Devalued currencies keep people working. Just make sure you have assets and not money. Oh, if the world was only that simple. Devaluing currencies means they are devalued against some other currency. When everyone wants to devalue their currency to “keep people working”, which country is going to sit back and watch their currency rise and lose their jobs that, say, Canada wishes to gain ? China is in a precarious position with the yuan tied to the U.S. dollar. So the yuan has risen huge against the Japanese yen and Japan works to destroy the purchasing power of the yen to boost their exports. China will make a move to lower the yuan, incrementally or suddenly. And Mexico isn’t going to sit back and give Canada their jobs, so what is it ? Rob jobs from the U.S. ? Keystone is a good example of American rope-a-dope. The U.S. isn’t just going to “gift” jobs to Canada. They have plenty in their bag of tricks to counter a lower loonie without trying to destroy the USD. A lower loonie is just disguising the truth of an overbloated economy, stultifying government overhead- taxes, hidden taxes, fees, licenses, quotas, absurd regulations, etc. The old camel can’t carry another wet bale of hay. So, killing the loonie doesn’t address the problem of a resource dependent economy heavily peopled by a mandarin class who, frankly, don’t give a damn about impoverishing their private sector neighbours. In fact, a classic example- the minimum wage in Canada still puts a minimum wage earner into paying income taxes which go to well-paid government workers (workers who have never seen a recession). Every raise in the minimum wage goes directly to increased taxation, making the lives of government mandarins more comfy. No wonder, government unions are in the forefront for increasing minimum wages. Good luck with the idea that collapsing the looney vs the USD is going to do anything more than create misery for the other half of the population in Canada. It’s called “Beggar Thy Neighbor” for a good reason, and in the new global economy, everybody gets into this game. That’s a great way to think of it. “Many have their homes paid for, so rising home prices are not a problem for everyone.” ie, not my problem. As a parent with 3 adult children living and working in Vancouver, I cannot see them ever owning a home in Vancouver. Working class people cannot compete in a real estate market dominated by “hook or crook” money coming from a country with no pollution laws and slave labour. Canada is rapidly turning into the “I’m alright Jacks (you)”, the foreign super wealthy and those that live off of them- and everyone else can take a hike. To Wolf’s point about velcroing Poloz’s lips shut. We have squandered the Chinese resource boom and the looney is heading to 60 cents. Pierre Junior, will have a deficit approaching $20 billion the first year and it will grow from there. The “I’m alright Jack’s”, government employees, and the super wealthy, domestic and foreign, will survive and thrive while Canada’s private working taxpayer will collapse under the burden. Draghi was said to have created the mother of all shorts… until suddenly it wasn’t! Personally I wouldn’t bet a dime based on CB jawboning. Let me disabuse you of that idea. Virtually all expenditures in excess of taxes and fees collected in B.C. are shifted to off-balance sheet accounts. The usual method is to create a corporation, load it with debt, and don’t show the public that debt. The new multi-billion dollar Port Mann bridge is a good example. It cost several billion to build and none of it is recorded in the B.C. governments budgets or accounts. “Bridge corporation XYZ” holds the debt in an off-balance sheet account. Look to B.C. government debt and the debt of all crown corporation and you will find “balanced budgets” have been a fiction for decades. Here in Florida the high dollar will mean less Canadians coming for the season. That will definitely hurt the economy here. Those Canadians that bought real estate at the bottom of the market, and there were many, might find that now is a good time to sell here and buy there. That trend is shaping up here in the Palm Springs area. Canadians were major buyers of real estate here until last year. And half of them are from Alberta, which is now in a depression. That customer base is drying up due to the weak loonie. If they all decide to head to the exits and sell for a big profit, the market will tank here, and probably in Phoenix as well. The real estate market here in Palm Springs is already softening. For what it’s worth, the government is trying to deflate the property bubble. This week they increased the size of the required down payment for houses between $500,000 and $1,000,000 to 10% (from 5%). I don’t know how much it will affect Vancouver (where houses are higher and the insurance is not backed by the government), but it will probably have substantial effects in Toronto, and especially Calgary . . . The down payment on homes has to be what it once was and that is 25%. Raising it from 5 to 10% for a ” portion ” of what is over 500,000 is a joke when you do the math. They should also get rid of the speculators by making it into law that you cannot re-sell a home for a period of 10 years. These stupid property flippers are flipping themselves out of the market. Everyone can thank Keynesian Economics (Liberal) and Bill Clinton (Liberal) who promised a home for every American and we here in Canada started that same scheme. Lastly part of the problem is that the people in charge have no idea what Capitalism is about, they only care about keeping you poor while filling up there own pockets. Hence Global Warming Scam. One last point if I may. Canadians will be paying through there nose at the Retail level once the Carbon Taxes are put into place. That’s 20% Tax at the Retail Level and the USA will soon follow. That’s why during the next Oil boom in 20 years you will be paying $2 a Liter in Canada and 8 to 10 $ a gallon state side. They’re trying to inflate it not deflate it. Poloz already said he would not raise interest rates if America does. To those of you who say their doing so well here living on the West Coast, That is not what a poll survey released by the Canadian Payroll Association says, It states 52 % of British Columbians are now living pay cheque to pay cheque, for all of Canada that number now sits at 48% of Canadians as a whole. (Link Below) This number has increased 20% since 2011, With statistics like that you’d need to be delusional to believe house prices can keep going up. The number suggests Canada is on the precipice of another great recession like 1987 where home prices dropped 26% the difference this time is household debt has ballooned 10 fold along with home prices. How do the delusional masses believe house prices can continue to go up when most Canadians don’t have enough to get by month to month? Making it worse, I believe I read that Canadians have the highest debt/income ratio in the Western world. A chart like this does not help anyone “question” the rationale behind the move, i.e., change in valuation. I do not question Rolf’s analysis or the comments from the readers. I do note however that nations like France, Italy, Spain and Portugal would be very happy to be able to lower the value of their local user currency, to help prop up the domestic economy and cope contemporary market forces. For 25 years (1953 to 1977), the Loonie traded mostly at parity with the US Dollar. This was also the case from about 2011 to 2014. The Loonie traded at a deficit during the other periods and deteriorated to as much as US$0.63 = C$1.00. For foreigners, the Loonie was damn cheap at US$1.60. Canadians, being paid in US Dollars for their products (like gold miners), will make good money because their Loonie cost of operations are falling in US Dollar terms. The bulk of Canadian trade is with the US. With the USA in recession and now headed into an economic depression, Canada has to do something to “get the money”. That has resulted in making it very easy for foreigners with cash money to buy stuff in Canada. The sale of a Canadian home, farm or business to a foreigner should count to “lower” the trade deficit. I love Canada and could have very easily moved to Canada and become a Canadian citizen. Too old to do that now, with my family and property in the USA. Looking forward to my next fishing trip to BC for steelhead and Salmon in New Brunswick. For those, who know the raw beauty of Labrador, you will understand why my love of Canada has never faded. Far away from the problems of metro Canada. Just you, me, the timber wolf and the giant brook trout. prepalaw, I grew up in the So. Ont. area (Golden Horseshoe), and so I know Buffalo very well, (oh, the old Bills and Sabres hockey games, those were the days). What a great airport you have there–easy to get in and out of the area, cheap parking, very quick shuttle to and from the airport, very nice people, never much of a lineup at check-in, security, etc. Parking lots are always populated with Ontario license plates, I wonder why? the spray did not work – the 2-year bear stalked us in stealth and attached us on the flood plain of the Mistastin River. The bear only saw ham-hocks and probably never encountered a human before. We stoned the SOB, with my friend connecting with shot put-sized rock to the skull. Stunned the creature. Our guide stupidly left the 30.06 rifle in his tent! After escape and evasion onto an island in the middle of the river, I was swept away by the stiff current and almost drowned in a back-eddy. Bottom line: I will not return to Labrador or Quebec because Canada forbids me from bringing my 44 Ruger Redhawk handgun for self-protection. Never enter the woods without it anymore. The foregoing was about 20% of the total story. Still love Canada. Bring the handguns back to the people! My point is to not hold the loonie. yes, it is rather simple, but important , nonetheless . Buy as much local production as possible. Canadian dollar will follow further fall in oil prices and it could go down to 0.64c or less (especially if oil goes to $20 bucks). It is OK, will travel less abroad and stay home enjoy some of best fresh water beaches and sunsets in the world (Grand bend, Sable beach etc.) and maybe even visit BC, Alberta do some fishing or go Yukon hunting. What Wolf forgot to mention in this otherwise great text is that many other currencies are on the same path as CAD$. There is currency war going on out there. As Canada heads back into recession (which they never came out of 2 months of positive growth were a direct result of Conservatives forking money over to the masses to buy votes before the October election this year) finally the clueless millennials will lose their jobs. They and the first time buyers are the bottom of the housing pyramid. When the base collapses the whole housing market collapses. For the record all and I mean all Chinese do the same thing. If one Chinaman buys a house in Vancouver they all do. If one Chinaman stops buying they all stop buying. The Chinese have stopped buying homes in the Greater Toronto area as of about 3 months ago (Markham, Stouffville and Richmond Hill). The aberration in the prices year over year in Toronto are a direct result of teardowns and rebuilds as well as fully renovated homes being sold. Poloz will do everything and anything to keep Canada’s real estate Ponzi from crumbling. Poloz is an idiot. You cannot devalue your currency to prosperity. Also thank you Poloz for rampant food inflation. I wonder what is going to happen to real estate prices when the Chinese start to run out of money? Shawn, they’ll start using Canadian Tire money–it’ll be worth the same pretty soon. I think Poloz’ comments were aimed at raising rates on US treasury bills, just as Mario Draghi could be easily depended on for saying the right thing to keep Eurodollar funding going. This gives The Fed room to manoeuvre on the rate rise. Essentially all of the money thus generated at the short end of the curve in US money markets gets plugged into Euro-denominated long-dated bonds. Canadian rates stayed where they were. This is not unlike Carney’s remonstrances about negative rates a while ago.